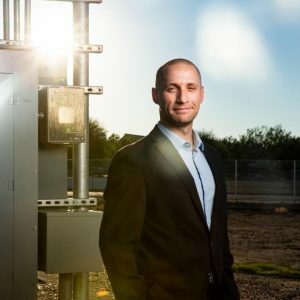 With a $2 million grant from the Office of Naval Research, an Arizona State University professor is working to improve on his solar-powered, electrical grid-in-a-box for use in far-flung corners of the world where power doesn’t reach. Microgrids are small isolated power systems, such as on oil rigs, in rural villages or at military expeditionary camps. Nathan Johnson, an assistant professor in the Polytechnic School, part of the Ira A. Fulton Schools of Engineering, created a solar-powered grid contained in a shipping container. “Microgrids are often described as an on-grid system that can isolate,” said Johnson, who is also a senior sustainability scientist in the Julie Ann Wrigley Global Institute of Sustainability. In summer 2018, Johnson received a $2 million, two-year grant from the Office of Naval Research.